CYRIL RAMAPHOSA THE SOUTH AFRICAN PRESIDENT has called on Zimbabwean leaders to accept the Constitutional Court judgement which validated and upheld President Emmerson Mnangagwa’s 30 July 2018 t election victory. www.newzimbabwevision.com says, isn’t it funny that with so many lawyers heavily in Zimbabwe’s politics, case in point Robert Mugabe,Emmerson Mnangagwa, Alliance leaders such as Job Sikala Douglas Monzorwa, Tendai Biti, David Coltart, Professor Welshman Ncube are all lawyers, yet Zimbabwe people continue to suffer ,..what a circus. 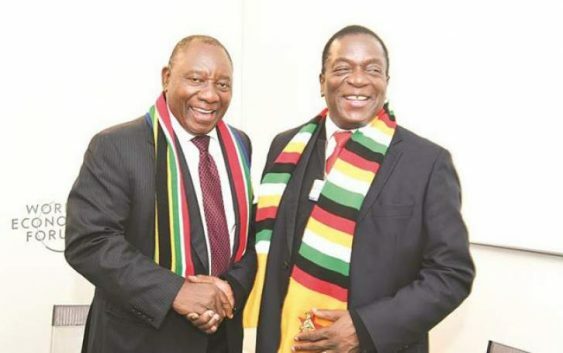 The South African president Cyril Ramaphosa issued a statement congratulating Zimbabwe’s President-elect Emmerson Dambudzo Mnangagwa on his electoral victory..
‘ZANU PF ECONOMIC EMPOWERMENT POLICY: ZIMBABWE IS OPEN FOR BUSINESS’: (ZRP) recover 13 Tvs, 4 dvd players , 6 home theatres, 3 gas tanks, 12 gas tanks, 15 pairs of shoes, and various items from a thieves hideout at at Retreat Farm near Waterfalls.